St. Nicholas' Church is a beautiful Saxon minster dating from the late tenth century which is internationally famous for its architecture. The fabric is in good order following a serious fire in 1986 and the restoration [which took two years to complete] has won several awards for the church's architect, Mr. Geoffrey Claridge. St Nicholas Church, Worth, is approached through a 16th century lychgate (restored in 1956) and thence through a delightful avenue of trees, sometimes known as the '10 Apostles'. It stands on its pre-conquest foundations being one of the few existing buildings to do so. 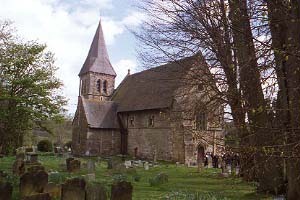 It is a supreme example of a Saxon church built in the style of the purely English cruciform churches which later became general throughout the land. The semi-circular apse is unusual. The church has retained these and other main feature, notably the original powerful chancel arch, 3 Saxon windows and the arches to the two transepts. Still to be seen, although somewhat differently from their original form, are the Saxon archways forming the north and south doorways. At once, however attention is drawn to the massive Saxon arch at the east end of the nave. At 22' high and 14' wide this is one of the largest pre-conquest arches still standing. The strength of its appearance and ruggedness of construction are at once beautiful and dominant, emphasising the altar beneath. Advancing from beneath the gallery look upwards to see the three notable examples of Saxon windows, 2 on the north side and one on the south. They are formed by twin arched light separated by a stone baluster on square stone bases. These windows are probably unique in that no others like them are known in the nave of a church. They were set at a great height for a purpose. In the troublesome times through which the church has lived, especially pre-conquest, almost every church was used as a place of safety to which people could flee for sanctuary afforded by the solid walls of probably the only stone building in the district. Such high windows offered further protection making it difficult for marauders to gain access. Close by are the north and south doorways with their original Saxon arches. These vary lofty archways are characteristic of late Saxon work. Some have it that the arches were created in this form so that a horseman could ride into the building, make obeisance to the altar or pray, without dismounting, and be able then to ride through and out of the opposite door without turning his mount. Whatever myths or truths there may be in this, these days the north (or devil's) door is filled in. Superstitions there may be about blocking up the devil's doorway but the truth is likely to be the practical effect of keeping out the cold draughts from the north! The crucifix in this arch is 18th century and probably Spanish in origin. At one time it was owned by a Bishop of Lewes. The 14th century south door occupies only half the height of the original opening whilst the porch beyond was added in 1886. Just to the east of this opening is a holy water stoup of the 14th century. A further stoup of similar date is beside the west door. Entering the church by the west door (14th c.) one stands immediately beneath the gallery bearing the inscription 'This Gallerie is the gift of Anthony Lynton, late Rector of this Parish, who deceased the XV day of June Anno Domino 1610'. At one time the gallery also extended the full length of the north side of the nave. Today's gallery is used by the choir. It houses the organ given in 1903 by Sir Weetman and Lady Pearson (later Viscount and Viscountess Cowdray) 'to commemorate the coming of age of their eldest son'. Worth, W Sussex, S Nicholas, 6, 9-2-14 in A.